Clear Screen Netting is great for putting on top or over your aquarium to stop fish and invertebrates from jumping or getting out of your fish tank. We carry 1/4" Clear UV Protected Netting. The netting is clear and the openings are 1/4"x1/4". 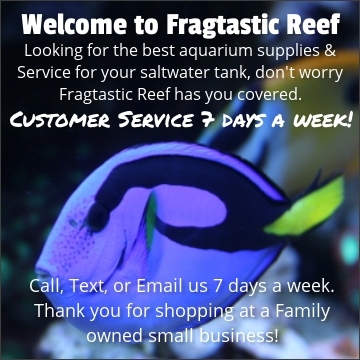 The netting we sell is a high quality UV protected netting that will last for years over your saltwater aquarium. Our netting is cut to order, our roll of screen netting is 4 feet wide, and any length you would need. If you need a specific size please contact us for any questions. This is a great screen netting for making a screen top and to prevent yourself from losing fish due to jumping on your aquarium! *Screen Netting is sold by the Square Foot. For purchasing just simply take your dimensions of the netting you need and enter the QTY as the SQ/FT Price. For example: If you want a 4ft x 2ft piece you would take 4x2=8. Total quantity you would put into your shopping cart is 8. Keep in mind our screen roll is 4' wide and plenty long enough for any sized aquarium. We will automatically add a few inches on both dimensions to make sure you have enough to stretch the netting across your screen frame. I needed to build a screen top for my tank to prevent suicide attempts and fragtastic reef had exactly what i needed. Was delivered, free shipping within 2 weeks and they gave me a little extra to make sure i had room. 1/4 nylon screen doesn't have an effect on the light and is very easy to install in the screen track that i bought at lowes. All together this screen top cost me $20 and will save me hundreds.